Birmingham city councilor Marcus Lundy bleeding after a fight with the mayor. You would be surprised by just how much power local mayors have. You’d think that an official in a town would be fairly limited, but you’d be wrong. Mayors can be very powerful, and like all politicians, they are prone to their vices. After all, they’re only human. And humans can have disagreements. The mayor of Birmingham, Alabama, and a city councilor had a backroom brawl during a council meeting. 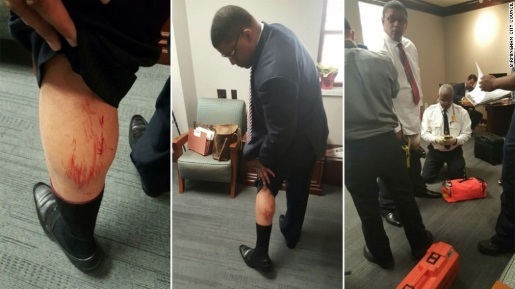 Mayor William Bell and City Councilor Marcus Lundy got into some kind of bloody exchange, and as a result both men were taken to the hospital. Not only that, Councilor Lundy is now being charged with third-degree assault. According to Bell, Lundy approached him in a private room after a disagreement at a public meeting and things turned loud and personal before both men resorted to fisticuffs. Lundy apparently grabbed Bell and started choking him until two of Lundy’s aides intervened; meanwhile, City Council President Johnathan Austin blames Mayor Bell for starting the fight. It’s a real mess down there in B-ham. “It’s extremely concerning, not just for me, but for our entire city so we’ll conduct a thorough investigation and try to get to the bottom of exactly what happened and what precipitated this incident,” said Birmingham Police Chief A.C. Roper at a press conference after the brawl.